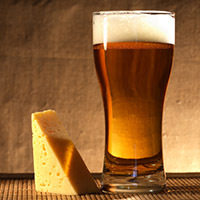 Keeping in the vein of celebrating this week, we give you the perfect pairing; cheese & beer! Using beer to refine a cheese is no novelty. But the technique that cheese maker Franz Renggli came up with truly is. 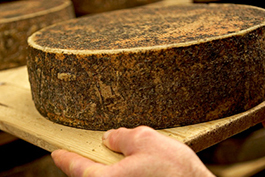 During its five months of ripening, the cheese is washed with beer from a local brewery in Entlebuch. This aging produces a mighty fine cheese full of taste and character. But that is not the finishing touch: Renggli coats the wheels with the dried and ground hops left in the barrel. Dark and coarse the cheeses turn, with a big nose of grain. The ultimate type of cheese for beer pairing. Try a medium bodied American brown ale or brown porter. In a way that only the Irish people can, the beautiful Cahill Cheddar with Porter combines the tradition of Irish cheddar making with the strong, robust flavor of porter ale. 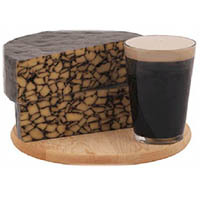 Made on Cahill’s Farm, tucked snug in the heart of County Limerick, by fourth generation cheesemakers, the rich, yeasty flavor of Dublin-produced Guinness stout complements a perfectly creamy cow’s milk cheddar. The striking, mosaic-like appearance of the cheese goes hand in hand with its impressive taste—medium-sharp finishing on a slightly sweet note with chocolaty, floral flavors. Pairing: A dark ale or porter is, of course, the perfect match.